Home » All Blog Posts » Tennis Anyone? The 2015 U.S. Open has the media abuzz, with fans rooting for the incomparable Serena Williams to perhaps win five consecutive grand slams. To date, she has already won the 2014 U.S. Open, 2015 Australian Open, 2015 French Open, and Wimbledon, 2015. The oldest player to win a major, she’s like the energizer bunny, and just keeps going and going. Win or lose, this #1 ranked player is a champion in every sense, so here’s twirl of the racket and well deserved kudos to Spectacular Serena. “I’m a perfectionist. I’m pretty much insatiable. 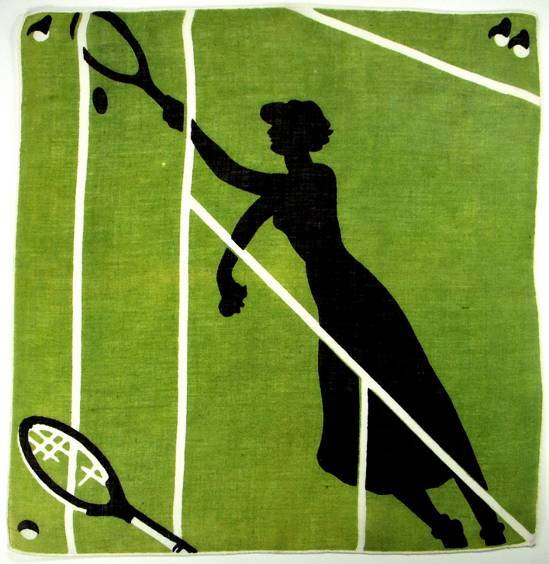 The punch, power, and pizzazz Williams displays center court is a far cry from the Victorian ladies who gingerly returned serves from soft green lawns, outfitted in floor length skirts and petticoats. 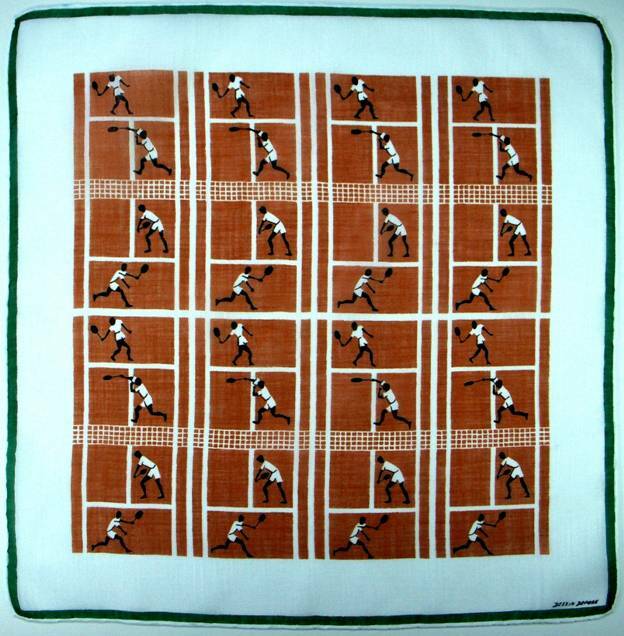 This cinnamon bordered hankie is as sizzling as Serena’s backhand. The giant white ball hurtling toward us helps date the hankie. In 1972 yellow tennis balls replaced the standard white ball. I assumed it was because it would easier to see them coming out of the sky when you were staring into the blinding sun, yet research confirms the ball color was changed to make it more visible to television viewers. Who knew? According to historians, the game was first played indoors, and originated in monasteries in Northern France in the 12th century as a form of handball. 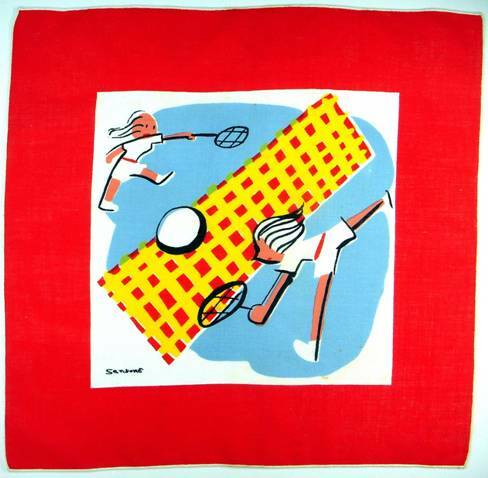 Known as jeu de paume (game of the palm) it gradually transformed over the ensuing decades to become the racket and ball game so popular today. 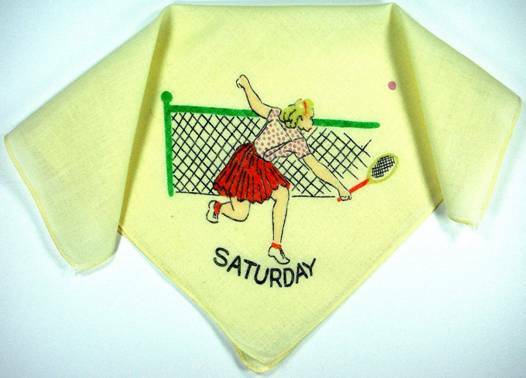 The repetition of images in this handsome hankie gives one the feeling of viewing multiple matches simultaneously, much like the camera coverage you’ll find at Wimbeldon. 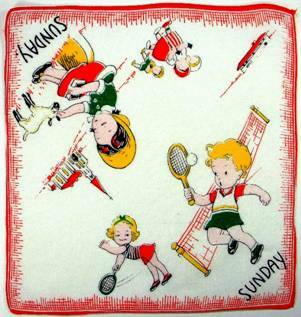 Day-of-the-week hankies were extremely popular with both children and adults, with images ranging from daily chores, to professional occupations, to leisure activities, to…you name it. Below, a weekend warrior gives it all she’s got. Is it my imagination, or is there a bit or moral tongue clucking in this children’s hankie? The demure young lady departing Sunday service pauses to pet an innocent lamb, while the church-skipping gal at the net is tarted up in mini skirt and provocative pose. What a hoot! 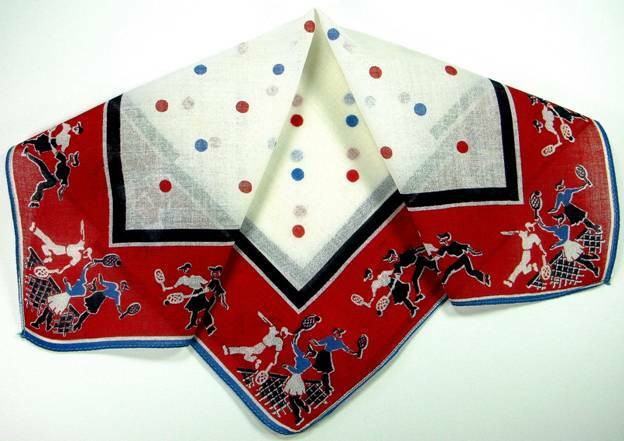 A lovely embroidered lady’s handkerchief portrays all necessary accoutrement for the game. Obviously it’s not to scale or that would be one scary butterfly! To me this crisp graphic silhouette is absolute perfection. We can deduce the era from the length of her skirt, but it’s as hip, powerful and exciting as any graphic you’d see today. 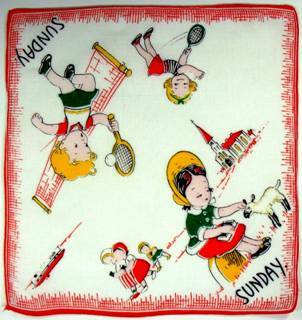 Handsome groups of energetic players adorn the border of this polka dot charmer. You almost feel as though the dots represent a plethora of volleys from an vigorous game. Blatantly obvious, yet unfailingly cute is this couple volleying “Love” between each other. The visual of course refers to the tennis scoring system in which Love = zero points. *The longest match in professional history ran eleven hours and 5 minutes!! In the 2010 Wimbledon epic between John Isner and Nicolas Mahut, An astounding 183 games were played, with 138 of those games being played in the decisive fifth set, which Isner won 70-68 after 8 hours and 11 minutes. I’m tired just reading about it. ** Conservationists recycle tennis balls to provide homes for harvest mice, Britain’s smallest mammal. Under the program, the mice, which normally weave their nests on tall stalks, set up house in tennis balls that conservationists have attached to stakes. Each ball has a small hole bored into it that allows mice to enter, but not their large predators. 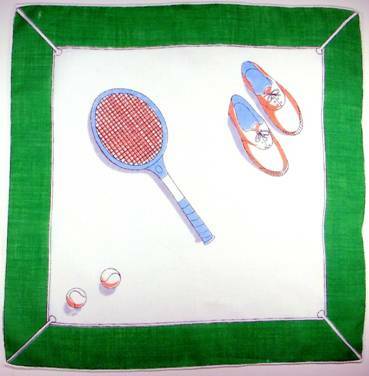 What a lovely assortment of tennis hankies! LOVE THEM! 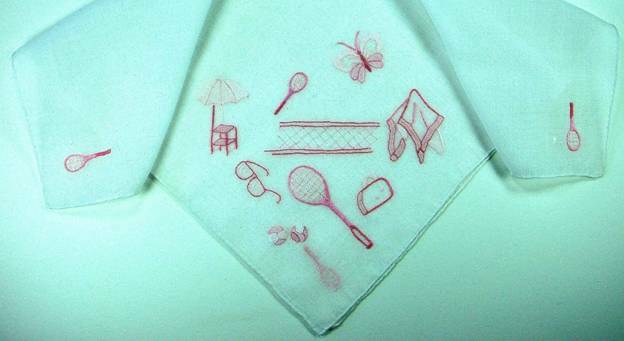 Your writing is as wonderful as the hankies. A tidbit of history. The Paris museum that housed the Impressionist’s paintings before the Musee D’Orsay was the Jeu de Paume – a handball/tennis building before it was a museum. Now there’s a great trivia tweet! 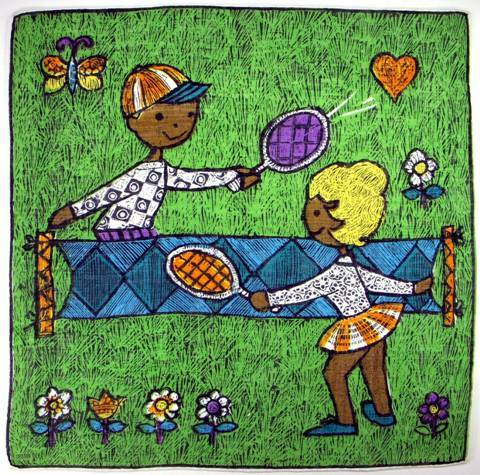 The cute couple playing tennis is one of my aunt’s designs.Her name is Ritva. She is from Finland and worked in Paris, France in late 1950’s for a short period.None of her designs are signed, but they are very distinct. I collect her designs and am happy to see this one, it’s new to me. Oh how exciting to know this! I have several in this style – the wedding, new baby, Happy Birthday, Congratulations, skiing, ice skating etc. Were these all designed by your aunt? I would LOVE to know more about her. Perhaps we could feature a blog on her. I welcome any and all information. Thank you SO much for writing. Yes, they are all hers. I have collected 18 so far and keep searching for some designs that I know are out there. Ritva lives in Colorado now. She is 83 years old, widowed earlier this year. She has told me she worked just under a year designing for someone and her designs were sold to a Swiss company. I will try to get some more information about her time in Paris and get back to you. Also, I will ask her if she wants to have her full name published.